If you're still using the "old" one-arm escapements in your radio controlled model airplane, you're probably also still using that "greasy kid stuff" in your hair as well. Just like the hip guy has switched to Vitalis, the hip modeler has switched to multi-arm escapements that allow more than just full left/right or full up/down throw on the rudder or elevator, respectively. 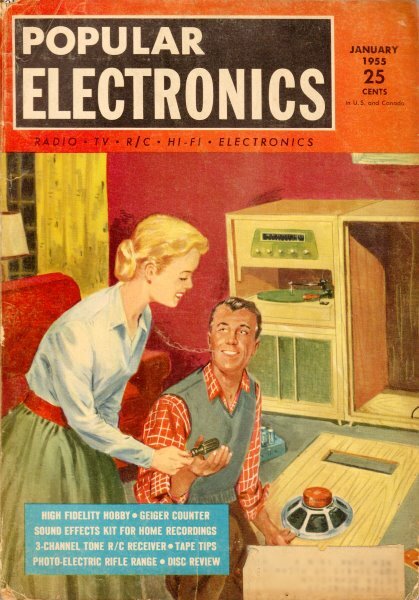 Today's equivalent would be advocating for the use of digital servos versus the "old" analog servos. The more things change, the more they stay the same. Here is my Bonner 4-arm escapement. Although the one-arm escapement is capable of allowing the R/C model air­plane flier to execute a wide variety of maneuvers, more and more complex escapements are being used. These provide a more flexible system of control, allowing more intermediate positions for the rudder, stabilizer, etc. In order to describe the operation of the more complex escapements, each extension will be referred to as a finger; each finger is intercepted by catch points as it rotates. The three-finger escapement is illustrated in Fig. 1. Notice that the fingers are set 120 degrees apart, and that the catch points of the relay armature are located exactly the same as those on the one arm (or two- finger) escapement. The solid lines represent the signal "off" positions. The dotted lines represent the signal "on" positions. Fig. 1. Three finger R/C escapement furnishing three left positions, two right positions, and one neutral crank position. Fig. 2. A four finger escapement with three left and three right positions, two neutrals. This of course allows for more flexible control of a model airplane or boat by radio control. Fig. 3. A four finger escapement. Fig. 2 shows its mode of operation giving three left, three right. and two neutral positions. Fig. 4. 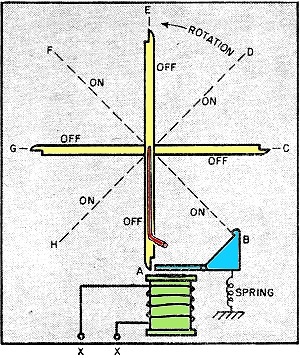 The Bonner compound escapement used for radio control. Notice the ratchet wheel and rocker arm combination for smoothing out the rotation and the spring contacts on the front view. To complete a 360-degree rotation of the crank, the following signal sequence is necessary: "on-off," "on-off," "on-off." This compares to the sequence for the two-finger escapement which is: "on-off," "on-off." Why use this type of escapement? The reason is more control. If the distance H is made equal to the distance from the shaft to the crank, the deflection of the loop to the right and left will be equal in positions C and G. These are the first and third "on" positions respectively, and represent the maximum deflection possible. Now notice that the loop will be deflected in positions D and F, but not as much. These are the first and second "off" positions. The B position is neutral; E is so slightly left that it can be used as a neutral. Thus, with this type of escapement, it is possible to have two positions to the right and three to the left and also a single neutral. In steering applications a rudder may be placed in the "half" positions and allowed to remain there as long as desired without consuming power. One can also have full deflection in either direction, but only while the push-button is depressed. This is desirable particularly in planes where sharp turns do not want to be sustained. A typical four-finger escapement is shown in Figs. 2 and 3. This type is popular for boat steering. The catch points of this escapement move the arms in 45-degree jumps instead of the 90 degrees of previous types. 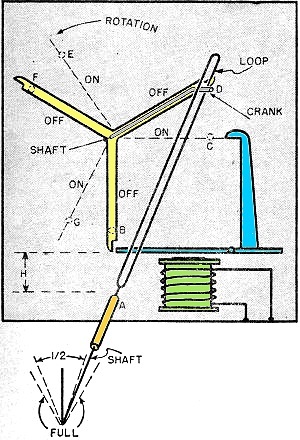 This type of escapement will provide three positions left or right, as shown in Fig. 2. To remember just how many times to push the button to get a particular deflection will be a problem. It is possible, however, to design a ground control unit which will send forth the correct sequence for the position desired merely by moving a steering lever or wheel to the left or right. The sequence of signals is simple and can be readily performed with a push-button. Pushing the button once will give "left." Holding the button down will prolong this position. To obtain "right," push the button down; release, and down again. Hold it down as long as you desire "right." For the third function, the sequence is "on-off," "on-off," "on." If one sends two quick pulses for "right" and desires to repeat "right," he just sends the same two pulses as before. The same applies to "left," or to the third function. This is possible because the escapement is designed with only one neutral or starting position. It returns to this neutral automatically whenever the signal remains off for any length of time. Other escapements can be made to do this, but require that a "neutral" command be transmitted after the steering command ends. How does the Bonner compound work? Refer to Fig. 4. Notice that the fingers are not symmetrically spaced. This is done to allow the crank to be positioned left or right by the "on" catch point only. Notice also that the finger to which the crank is attached is offset. 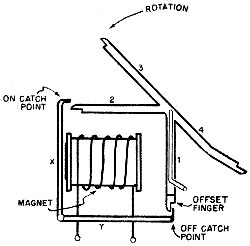 The "off" armature catch point is also offset to intercept it alone. 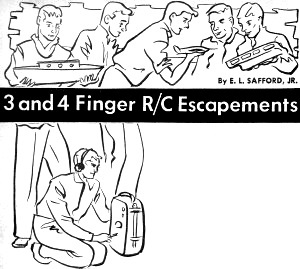 Thus, in the signal "off" position, this finger is intercepted by the armature catch point and this corresponds to the neutral steering position. Assume that the escapement has a rubber-band attached and is ready to operate. Refer to Fig. 5. If a signal is transmitted, armature Y pulls down releasing the offset finger. At the same instant, the "on" catch point moves in and finger 3 is intercepted and held. This is "right." If now, the signal is turned off, this catch point moves back, releases finger 3, and the shaft rotates clear around until the offset finger (1) again en­gages armature Y. The steering element has returned to neutral. 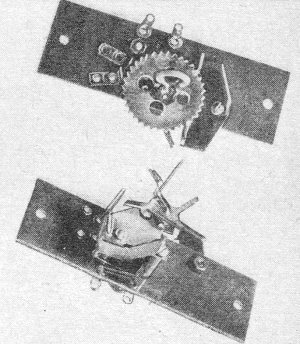 Notice the front of the escapement with its ratchet wheel and rocker arm that engages the teeth on the ratchet wheel (Fig. 4). 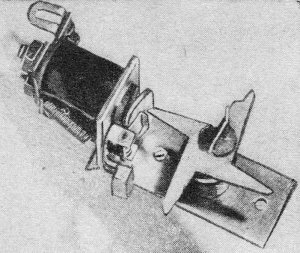 This prevents the escapement shaft from snapping from one position to another. It causes the fingers to move around at a definite speed. Fig. 5. Diagram of the Bonner compound escapement in the neutral position. For example, to obtain "left," a signal is sent causing armature Y to pull down. Finger 3 is intercepted by the "on" catch point. Now, assume the signal is broken for just an instant and transmitted again. The rocker prevents the shaft from snapping around and so, the "on" catch point which moved back when the signal was broken,. now moves forward again before finger 4 can get by. While the catch point holds finger 4, the crank is "left." If the signal is turned off momentarily and on again, the offset finger slips by, but finger 2 is caught and held. The crank is almost at neutral and there is no steering, but another part of the escapement now enters the picture to do another job. Right behind the ratchet wheel is located a set of spring contacts which are now closed by a tiny nub on the bottom of the wheel. This can close a circuit to operate the extra function, which can take the form of a motor speed control, reversing control, gas feed control, etc., depending on the type of model controlled.